No Thin Mints are actually harmed in making this recipe! However, this Puppy Chow tastes like your favorite Girl Scout Thin Mint cookies! 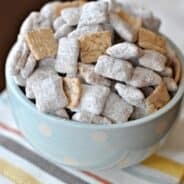 The last time I posted puppy chow there may have been some confusion about what exactly I meant by “puppy chow.” It’s Muddy Buddies. Puppy Chow. FOR HUMANS. Now, I hope to not receive any nasty emails about how chocolate is bad for dogs. K, thanks. But I did get a chuckle out of your dedication to your hounds. However, if you had read my post about puppy chow it would have been clear that it was for people. Just sayin. Now, let’s get to THIS puppy chow. Raise your hand if you love Thin Mint cookies? Raise your hand if you can eat a whole sleeve of Thin Mint cookies? Raise your hand if you can eat a whole box of Thin Mints? I combined chocolate Candiquik with a 3.5oz Green & Black’s Mint Chocolate bar and melted them together. It was the perfect amount of mint needed in this chocolate combination. I know Nestle also sells dark chocolate and mint morsels. Those would work too! I also added in some mint m&m candies that I found at Target. It gave them such a cute color, perfect for St.Patty’s Day! Needless to say we devoured this treat quickly in our house. I thought maybe it would last longer than a box of Thin Mint cookies. Nope, we just ate more!! Ha! Today my BFF Jocelyn from Inside BruCrew Life is also posting a Thin Mint Recipe! We are always on the same wavelength when it comes to desserts! Check out her Thin Mint Fudge Brownies! Love Puppy Chow? 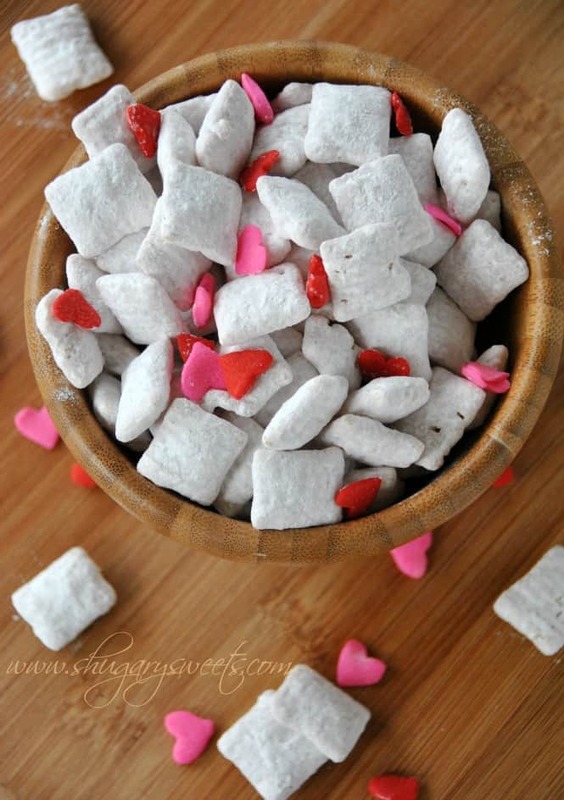 Try this Cherry Vanilla Puppy Chow I made for Valentine’s day. You can use any flavor of gelatin to give your white chocolate a new flavor! Love Chocolate and Mint together? Yeah, me too! 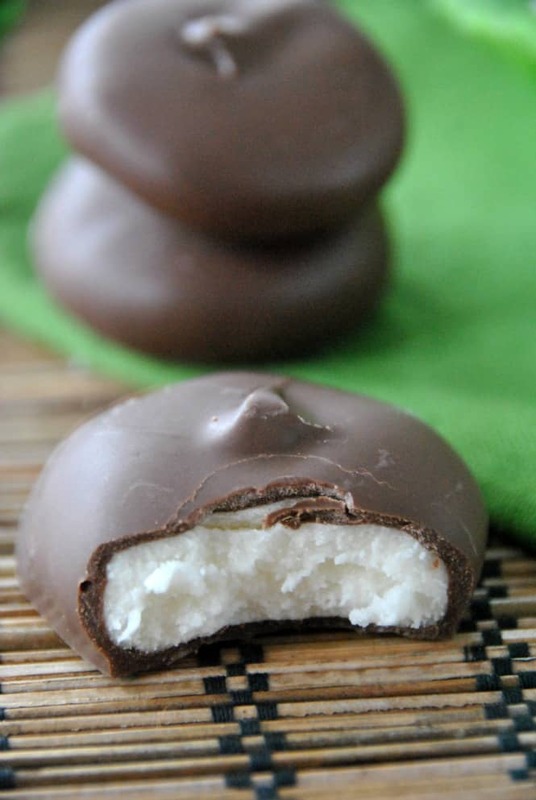 And of course Homemade Peppermint Patties are the perfect chocolate mint candy on the market. Right??? Easy to make too! 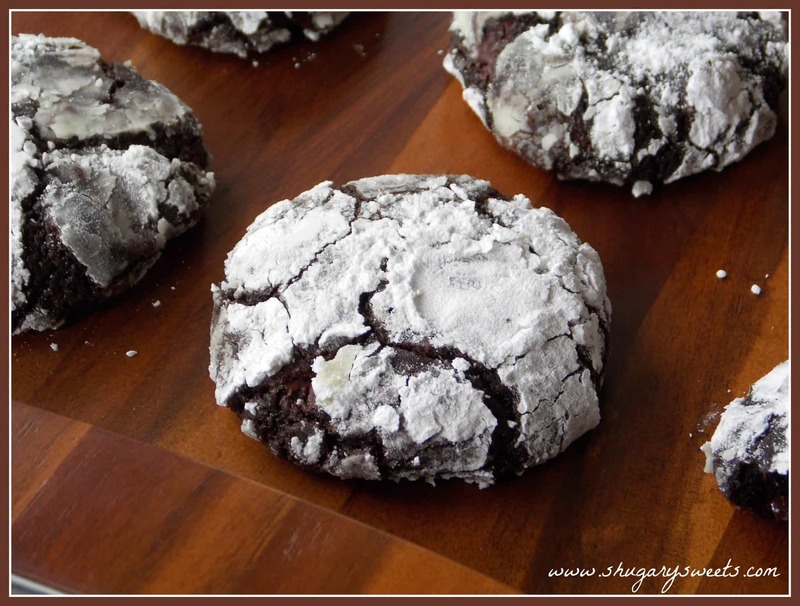 Using more Green & Black’s Mint Chocolate I created these Dark Chocolate Mint Crinkle Cookies. They are so rich and fudgy you won’t be able to stop eating them. That’s your warning!! Let’s not forget Chocolate and Peppermint. It’s not just for Christmas. 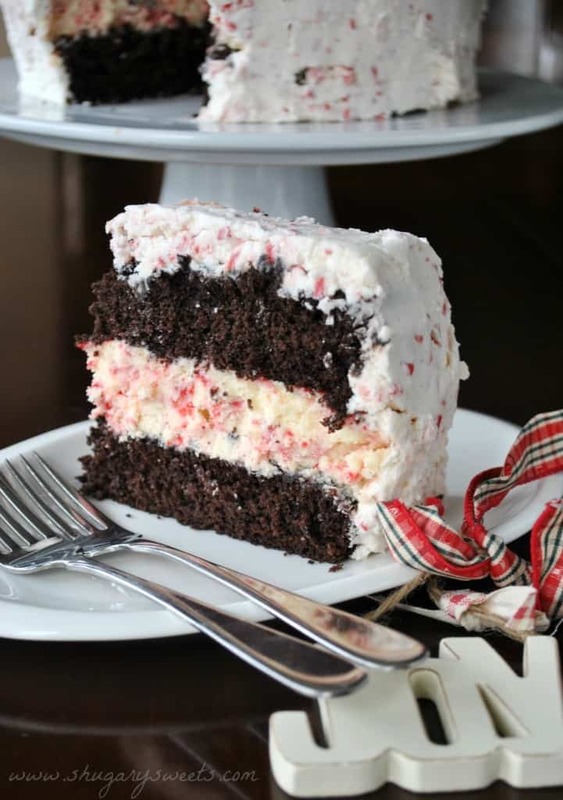 Especially when you add cheesecake to the mix, like in this Chocolate Peppermint Cheesecake Cake! In microwave, melt chocolates together for one minute, stir and continue melting in 30 second intervals until smooth (mine took a total of 2 minutes). In a large mixing bowl, combine cereal with melted chocolate. Folding with a large wooden spoon until all cereal is coated. In a large, gallon sized ziploc bag, add powdered sugar. Spoon in chocolate cereal mixture. Seal bag and shake until powdered sugar is coating all the cereal completely. Pour onto a large piece of wax paper and allow chocolate to set (about 20 minutes). Combine candies with chex and store in an airtight container. ENJOY! Yumm! 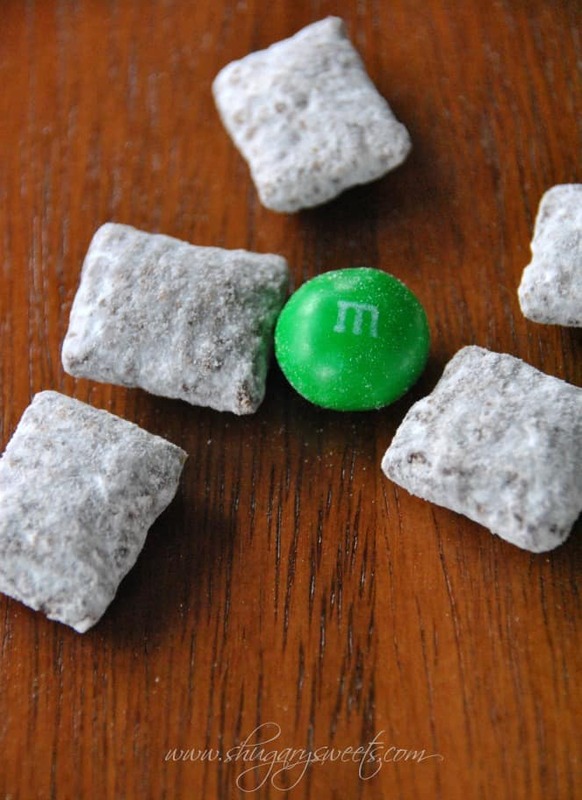 I came up with a recipe for Thin Mint puppy chow/muddy buddies last year, but I love the idea of using M&Ms in it – love M&Ms..I still haven’t tried the mint ones yet! Definitely going to have to try your version asap! Oh the mint ones are delicious! I’ll have to check out your version. Did you use actual Thin Mints?? Yeah, at $4 a box, you don’t want to use the real thing!!! ENJOY! My hands are raised high with you…those mint cookies are way to addicting. I know I would have the same problem with this puppy chow…no way to stop!!! Although I am wondering where my package is???? I knew your hand would be up 🙂 You package is sitting here held hostage until those brownies are delivered! OMG I can’t believe people got all worked up lol! 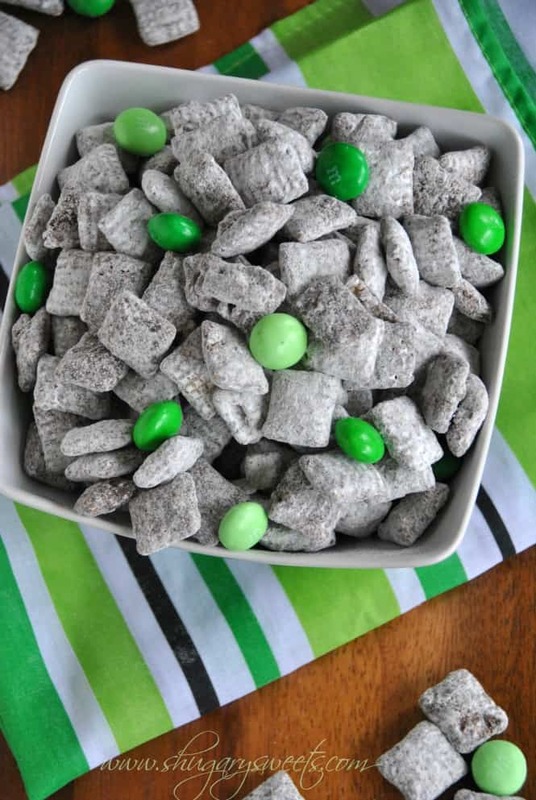 Thin mint puppy chow sounds fab!!! Half a dozen emails plus facebook comments!! Crazy, right?? I understand that negative comments would upset you over something that should be clear, unfortunately some people just aren’t educated to know that chocolate is dangerous to puppies. I’ve always known this kind of delicious snack as People Chow! That might eliminate confusion. Seriously? People don’t know that? Well, we can all rest easy now that you’ve enlightened us all. Please give people some credit next time. So now I know where you stand with eating Thin Mints. A whole box eater too!?! I agree about Puppy chow, all flavors are delish. You are genius! These sound absolutely perfect! Thanks for sharing! Thanks Amber. I will let my family know I am a genius too!! I need a good ego boost every once in awhile! I’m cracking up, because I had the SAME reaction from people when I posted my Cake Batter Puppy Chow. “Why would you feed your dogs cake batter?…Why are you posting a dog food recipe?…” I brought some to our dog trainer and it took a good 10 minute explanation that it’s called puppy chow, but it is in no way meant to be given to dogs! Adding mint to the chocolate sounds fantastic! Must try this soon! I actually did raise my hands. 🙂 I love thin mints, I love puppy chow…I love THIS! LOL, seriously? Too funny. My dog would like this though, and I’d have to keep it FAR away from her, ha! LOVE this version Aimee. The best! Well, my dog would love this too. She is quite a food thief. But if I share that too publicly (like I did back in October how she stole my sugar cookies) more hate emails will come my way! You had me at Thin Mint…I’ve shared on FB and pinned! Thank you for the idea and sharing the recipe!! no thin mints were harmed… lol! so funny Aimee. I am in love with puppy chow. As you know. 🙂 And mint and chocolate is such a great combination to throw into the puppy chow mix! Okay, I am going to have to make Puppy Chow or Muddy Buddies real soon! Every combination I see on different blogs look so good! I like the addition of the green M&Ms too! Love how those green M & M’s stand out. Great combo of flavors here. Wonder if this would last longer than my thin mints??? Doubt it! Thin mints are taking over the world and I love it! I dont understand how puppy chow can be perceived as anything but human food but whatever. Green and Blacks is my favorite chocolate, a good choice to pour over the Chex. 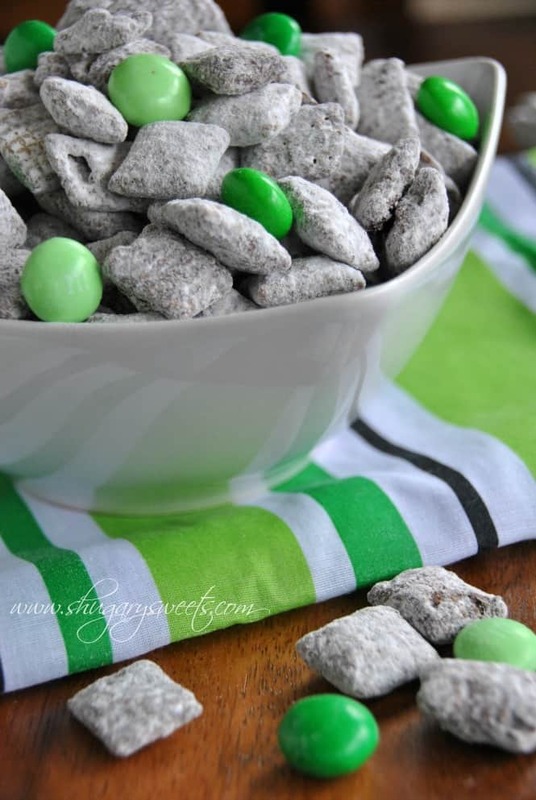 I can only imagine how addicting this Thin Mint Puppy Chow is! I love Green and Black’s too! It’s such a smooth chocolate! I love Thin Mints and I love how your P.C. always is so well-coated with sugar, not skimpy…thank you! At least half a dozen emails, plus facebook comments. Obviously they saw the title and never read the post. youre in good company. I can polish off a whole box of thin mint girl scout cookies. This puppy chow looks dangerously good! Thin Mints are my favorite Girl Scout cookie flavor because I love chocolate and mint together in any way. This looks delicious, and festive! Thanks Marcie. I’m tied between the Thin Mints and the Samoas. Guess I need to make Samoa Puppy chow! Fortunately, my daughters had a party that they had to bring a snack. You can be sure this was sent right away! I did eat my fair share before it left the house!! Thanks for pinning Jess. 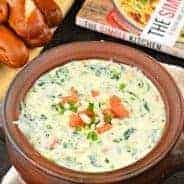 I hope you give the recipe a try!! This sounds like a great combination. 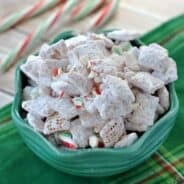 We are addicted to puppy chow so I can’t wait to give this one a try! I admit I’ve never had puppy chow before because the name totally freaks me out. But this is so pretty and I love the idea of a thin mint variety! Don’t let the name freak you out. Just call this recipe “copycat thin mints” ENJOY!! Ahh I love this idea! 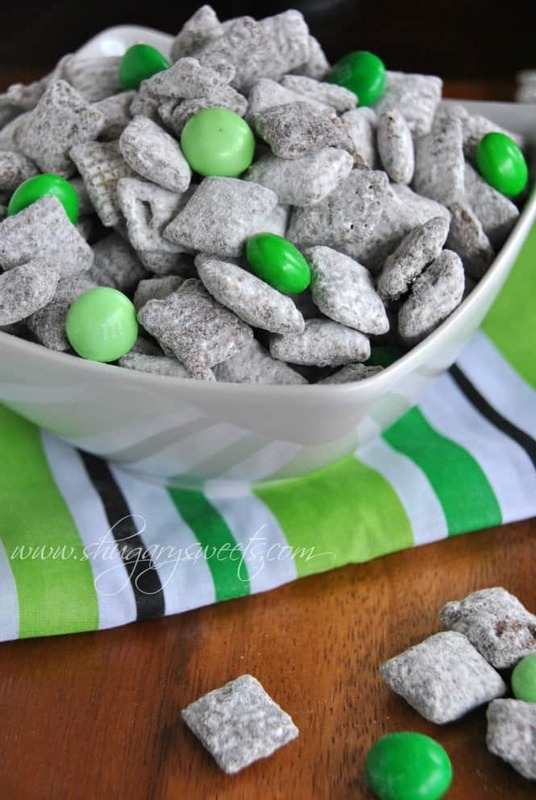 Thin Mints are by far my favorite Girl Scout cookie, so this puppy chow sounds amazing! Love the pops of green candies in there too. Perfect for St Patty’s day! It’s like everywhere I go girls scouts perpetually ask me to buy their delicious cookies, and I have to duck quickly into the grocery store before buying a gajillion boxes. Because there are never enough in one box (duh) but this puppy chow is like the answer to my prayers! 😀 WOO for Puppy Chow! I know, fortunately I’m able to duck away at the store because I shop on school day mornings 🙂 But at church and home I can never say no! I didn’t know puppy chow could get better–but thin mint??? YUM. I could totally eat an entire sleeve (or 4) of thin mints in one sitting. They are daaaangerous in my house, and this would be too! where do you buy Green and black chocolate bars? Whole foods… And around here Kroger. But there is a “where to buy” locator on the Green and Black’s website that is linked above. Thanks Katie 🙂 Other chocolate bars have mint flavor too if you can’t find it!! I loveee puppy chow but a thin mint version? Holy moly. I usually don’t make puppy chow since I have a huge problem with eating way too much… but this is just calling to me : ) haha I can’t believe people thought it was for their dogs though! How funny! I know!!! HUMAN food. I have a problem with it too. Fortunately, with my big family, we all devoured it. And then sent the remainder to a party my girls went to! Loving this combination so much. Puppy Chow is my weakness! 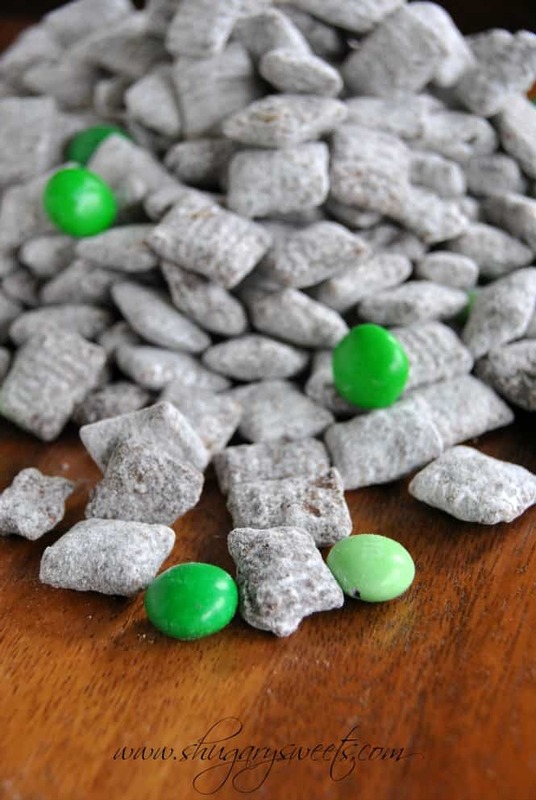 I remember puppy chow as a kid – but I never thought I’d see a Thin Mint version!! Ahhh!!!! Thanks for the clarification. I was wondering what puppy chow meant also. This is a GREAT idea that can work for many cookie recipes. Glad I cleared it up! ENJOY. Oh my!!!! I’ve been making Puppy Chow for 20 years now! Everyone in my family loves it but me (I don’t like peanut butter). This! Well, Thin Mint Puppy Chow is absolutely for me!!! Thank you for sharing this recipe! I can’t wait to make it! time for you to enjoy now Sandy!!! I love this combination! Thin mints and puppy chow are two of my favorite things. This will keep me going when girl scout cookie season is over. I could snack on this, whole day. Yikes!! Oh Aimee, this looks like heaven in snack form.Such a pity that the UK doesn’t have literally ANY of the ingredients to make thhis. No muddy buddies (only wheat chex-like cereal), no mint M&M’s and no thin mints. Oh my goodness, this looks sinful! My husband’s grandma makes all of her grand kids a huge batch of puppy chow every Christmas. I am going to have to try this version. I love mint and chocolate! So perfect for St. Patrick’s Day! We would love to have you link it up at our Wednesday Link Party, we are giving away a Le Creuset French Oven! Oh, how super cute for St. Patty’s day!! You are goooood! I never comment but I just made this! It was soooooo good! So glad you commented and even happier you enjoyed the recipe!! I’ve never heard of puppy chow, but this looks divine! My poor kidlets have been down with that monster cold going around, so I’m running out to get the ingredients for this. We’ll make treats, and then curl up and watch movies together while eating them. Thank you so much! I don’t know how, but this stuff tastes exactly like a thin mint. It’s become my crack! I made my first batch last week and still have some leftover (shocking, I know! ), but I nibble a little each time I walk by my kitchen counter. Just threw together another batch for a birthday party tomorrow and plan on making another for my book club meeting. Having recently gone gluten free, this is a treat I can still enjoy, and enjoy it I do! Now, which way to the treadmill?! So glad you enjoyed this recipe! We love it!!! Thanks for letting me know you tried it, and love it too! Love puppy chow and thin mints are my favorite cookies but what is a 3.5 Green and black chocolate bar. I’m trying to picture candy bars and this one is not there can anyone help by telling me what to look for as I have several boxes of chex cereal. 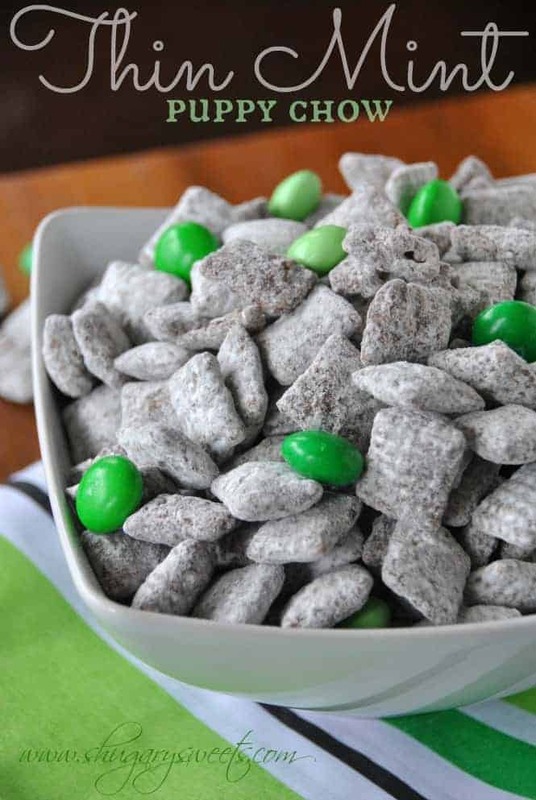 I just made this, my store does not carry the chocolate you recommend so I used Andes mint instead and used some peanut butter (I didn’t see the recipe on the bottom so I made it as if it was regular puppy chow but with the mint chocolate instead) came out awesome! Next time I make it I will follow the direction better 🙂 I’m a rookie stay at home mom. Thanks for this. Hello— Dying to try this— I have Andes Creme de menthe baking chips- anyone used this with just chocolate chips? Can I use those chips and regular chocolate chips? I haven’t used them yet, but if you try it let me know how it turns out! The original puppy chow recipe or muddie buddies recipe calls for kellogs crispix cereal not rice chex. I have been making it for almost 20 years. It is so much better with the crispix. Just sayin. 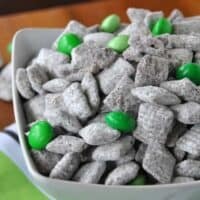 Actually..The Muddy Buddy recipe appeared on the back of the Chex box in the early 80’s….the recipe using Crispix was the one they called puppy chow. Either way, they’re both delicious (but I do believe Muddy Buddy’s were first on the scene…lol). What Kind Of Shelf Life Does It Have After These Are Made? Can You Freeze Or store in Bags Room Temp For Months? Oh! I have only every known it as puppy chow! Muddy buddies threw me off the first time I’d read it. I am excited to try this version. There’s a chai version out there I need to take a crack at as well. Just need a milk free version of that one. To people asking about shelf life….I have been making it for ever. I don’t know a shelf life. It doesn’t last longer than a few days, tops. Leftovers? HA! I want to try this with Andes Mint chips. I have a peanut allergy so I can’t have most chocolate barks and such. I think I will try it with Corn Chex too because I like them better than rice 🙂 This might be a nice substitute to actual Thin Mints since I also can’t have gluten. Thank you for posting this!!! I have been looking for a puppy chow recipe for years!! Made this one year in middle school and loved it!! So many different combinations to make!! Thanks again!! Hi! Just made this and it was amazing!! Thank you for posting this! I’m GF and haven’t had a thin mint cookie in years in this truly tastes just like them!! !